This article was written on 21 Dec 2016, and is filled under Volume 11 2016, Volume 11 No 4. CJNI was initiated by June Kaminski in 2006 when she was President-Elect of CNIA. She is currently Curriculum Coordinator of a Post Baccalaureate nursing program at Kwantlen Polytechnic University; President of the Canadian Nurses for Health and the Environment and Editor in Chief of the Online Journal of Nursing Informatics In 2012, June was honored to receive the CASN and Canada Health Infoway’s inaugural Nursing Faculty E-Health Award 2012 in Ottawa Canada. She also won the Distinguished Teaching Award from Kwantlen Polytechnic University in 2016. She offers the Nursing Informatics Learning Centre for nurses. As a nurse, editor, writer, educator and researcher I naturally support the notion of nurses as authors. This notion is one that seems logical: nurses are the most trusted profession, according to the most recent Gallup poll and have been for the past fifteen years (Gallup 2016). “ANA encourages nurses to draw on that trust to engage with consumers to improve their health and to advocate for patients and for the quality of care in this country” (ANA, 2016, p. 1). Nurses have a wide-angle perspective on what keeps people healthy, how people can be happy, and what strong resilient individuals, families, and communities look like. They readily know how to support people in times of crisis, loss, grief, and health challenges. They know how to teach people to live in balance with optimal health and stability. They have grappled with problems and discovered solutions that could benefit others beyond their workplace (Sheridan, 1994). Yet, so few present this knowledge and guidance through writing. Often, nurses feel they have nothing to add, nothing worthy of sharing with others. “Nurses should not assume that their ideas have already been shared; each nurse brings a unique perspective about a topic that may not have been developed yet” (Chamberlain, 2010, p. 16). In my mind, nurses need to learn to develop their writing ability and write for two distinct audiences: other nurses and health professionals and the general public. Writing for other health professionals requires strong, clear scientific writing skills while writing for the public is done with a more general, layman level of grammar and style, ensuring that people with a variety of literacy levels can understand what they have written. My premise in this editorial is presented in the context of writing within our chosen profession – to promote health, optimal practice, prevention, and innovation in practice, research, education and leadership. Nurse writers are nurses, primarily registered nurses (RNs), who write for general audiences in the creative genres of poetry, fiction, and drama, as well as in creative non-fiction. The published work of the nurse writer is analogous to that of the physician writer, which may or may not deal explicitly with health topics but is informed by a professional experience of human vulnerability and acute observation. All nurses have robust training and experience in both verbal and written communication. However, few think of themselves as writers. All too often, the idea of being a nurse writer is linked with being an expert researcher. Busy nurses often reject the notion of writing (and research), dismissing them both as time consuming, difficult and ‘out of their depth’ activities that is best left to more advanced educated nurses and nurse leaders. It is true that advanced education is needed to conduct robust research, but more and more researchers are working with frontline nurses and collaborations between academics, researchers, and practice-oriented people are becoming the norm. This implies that more nurses can become involved in publishing research results they have been involved in. Research is only one sphere of professional writing. “It is through publications that nurses contribute to the greater good of the entire professional community. Nurses often have a lot more to offer, in print, than they realize” (Lambert & Lambert, 2011, p. 80). “The art of writing embodies who we are: it enables us to present our thoughts, opinions, findings and arguments on any given subject” (Stone, Levett-Jones, Harris & Sinclair, 2010, p. 657). Nurses can also contribute significantly by sharing their experiences, ideas, expertise, and guidance with their peers and with the public at large. Nurses tend to be very careful with the advice they provide and are the perfect source for health information, answering questions, giving advice, and helping people to brainstorm solutions to day-to-day health issues. As well, nursing tips, stories and narratives can both inform and inspire other nurses to be inventive and look for the best ways to engage in their practice activities (Bragadottir, 1998; Chamberlain, 2010; Sanford, 2003). “writing is a powerful way of effecting change in the world, in a profession, and in a life. It connects us to people we can never hope to actually meet in this world; it can inform our colleagues of important information that can save time, money, and lives; and it can persuade others to change practices or opinions. Writing is a powerful tool that all nurses should use to put their stamp on their discipline and shape knowledge” (2012, p. 139). For many years, the writing landscape for nurses was usually situated in journals or books. With the advent of the Internet, and the explosive accessibility to writing via a myriad of devices, this landscape has grown exponentially. 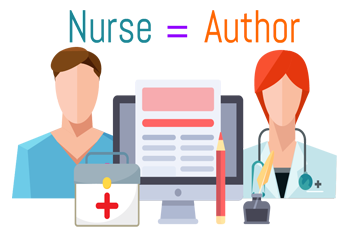 Nurses can now write on websites (their own or websites representing groups, organizations, institutions or dedicated to particular health conditions or issues), blogs (Deitering & Gronemyer, 2011; Brown, 2011), wikis (Billings, 2009), social media, health reports, and so on. It is relatively easy for anyone to present their writing for the whole world to see In the online environment. It has been argued that the world is hungry for the wisdom, insight, and connection with nurses in online spaces. Sayers (1999) points out that many health care organizations would welcome nurse authors for timely report writing as well as other types of writing. “Writers are employed to prepare grants, feature stories, interview summaries, qualitative evaluations, annual reports, and articles” (p. 1). “Begin with a familiar topic from your area of practice expertise. What has been your practice passion? An area where practice is evolving in your clinical setting? Have you been involved in a quality improvement project with exciting results to report to other nursing professionals? Your foundational knowledge will guide your literature review and make it easier for you to create an outline that will organize your content as you begin to write” (2014, p. 298). Blogging is another popular way to get your feet wet as an author. It is inexpensive, accessible, and offers ready proximity to an online audience. “Finding your inner voice and listening to it can take you down mental roads not yet explored, and expressing that voice requires open avenues so it can be heard. Blogging can serve as a means of self-discovery, professional growth, and feedback from those who read your posts” (Coghill, 2014, p. 24). Blogging can be targeted to a health professional audience or the public at large (Wolf & Morouse, 2015; Billings, 2009). “Patients increasingly are turning to the Internet for personalized, timely, and relevant health information; blogs remain a large source of that information. Nurses and other healthcare professionals can harness the informational, educational, networking, and supportive power of blogs, as well, and should understand how to access and use blogs for professional use” (Watson, 2012, p. 215). As Kathleen Heinrich (2014) pointed out, nurses need to support other nurses to hone their writing abilities and be brave enough to submit their work to journals and other types of publications. Heinrich encourages peer reviewers and mentors to do this with an air of compassion and respect for the writer. “Since many nurses see themselves as impostors when it comes to writing, self-exploration is an essential first step before learning the “rules” of publication” (Heinrich, Neese, Rogers & Facente, 2004, p. 141). Journal editors, website administrators and book publishers all need to adopt a supportive approach to encourage more nurses to contribute their expertise to the world of writing. Nurses often require ongoing support to learn to write well for a select audience. “Novice writers must be encouraged, empowered, and supported if they are going to write for publication” (Nickitas, 2013, p. 1). “A good basic approach, and one that works for me, involves four steps. First, spend some time think­ing about what you want to say before you start writ­ing. Know what you want to tell readers—the purpose of your paper—so that you can say it clearly. Next, sit down and start writing. Write anything you want to say about the topic; you can go back and organize later. (Contrary to what many of us were taught, you don’t have to outline first. Some writers write this way, but many don’t.) Third, leave the work alone for a while. Take a walk or do something else. And fourth, go back and start shaping and polishing your piece, paying attention to organization and transitions. Aim for a logical flow of ideas” (2014, p. 7). The acts of reflection, searching, organizing and actual writing necessary to publish have possible collateral effects on nursing practice as well. As nurses learn to write and articulate their viewpoint and their practice, to advocate and to guide, their critical thinking and perspective for holistic practice widens (Nickitas, 2013). Becoming an author and doing it well can actually improve your practice as a nurse. “Writing will make you a better clinician. As you force yourself to express your ideas in clear and concise prose, you will bring a new perspective to patient concerns and administrative issues. As with any other skill, practice increases your proficiency. If you are facing a challenge, write about it. The practice will further deepen your expertise. It can also expand your portfolio for career advancement” (McGuinness, 2007, p. 9). Regular writing also helps nurses to articulate and express their own voice within the health literary landscape. “Writers with voice are writers who have crafted a bridge between the speaking and writing modes, introducing elements of the former into the latter and thereby allowing the reader to ‘hear’ the person behind the words on the page” (Ryan, Walker, Scaia & Smith, 2013, p. 296). A published nurse is a visible and (with time, recognized professional (Happel, 2008). “Prospective employers may be more likely to hire someone who has published, and graduate school admissions officers consider publications an indication that a student will complete a program of study. Publications bring professional recognition to the author” (Chamberlain, 2010, p. 17). The mission of the Canadian Journal of Nursing Informatics is to provide a peer – reviewed venue for Canadian (and international) nurses and researchers who work with Nursing Informatics to disseminate their research, essays, reviews, presentations, multimedia and other digital publishable materials on a global scale. This includes nurses in all areas of practice, including nursing students. We encourage researchers, educators, and experimenters at all levels of expertise to feel confident in submitting their work for review. It is our mission to support fledgling as well as seasoned researchers in showcasing their work within the online environment. The Canadian Journal of Nursing Informatics (CJNI) serves as an online publication available to anyone interested in the evolving field of nursing informatics. You do not have to be an informatics specialist to write about informatics. The lived experiences of practicing nurses as they use various technologies, find solutions or give input to software or app development, or use blogs and social media to communicate with their patients are all important aspects of informatics. We encourage YOU to consider writing and sharing your knowledge and experience. Bragadottir, H. (1998). Invest in yourself. Every nurse can be an author: on writing for publication. Nursing Forum, 33(4), 29-32. Chamberlain, B. (2010). Preparing to publish: nurses as authors. Med-Surg Matters, 19(6), 16-17. Coghill, A. S. (2014). Let Your Fingers Do the Talking. ONS Connect, 29(4), 24-28. Deitering, A., & Gronemyer, K. (2011). Beyond peer-reviewed articles: using blogs to enrich students’ understanding of scholarly work. Portal: Libraries & The Academy, 11(1), 489-503. Happell, B. (2008). Writing for publication: a practical guide. Nursing Standard, 22(28), 35-40. Heinrich, K. T. (2014). Do You Know…How to Prevent Feedback Fallout: Make Your Peer Edits a Compassionate Critique. Nurse Author & Editor (Blackwell), 24(1), 1-3. Heinrich, K., Neese, R., Rogers, D., & Facente, A. (2004). Turn accusations into affirmations: transform nurses into published authors. Nursing Education Perspectives (National League For Nursing), 25(3), 139-145. Kennedy, M. S. (2015). On Writing: Just Do It…Reprinted with permission from the American Journal of Nursing, Volume 114, Issue 10, Page 7. Alaska Nurse, 66(2), 6-7. Krietsch, B. (2011). Nurses create blog to remedy confusion on pediatric issues. Prweek (U.S. Edition), 14(10), 21. Lambert, V. A., & Lambert, C. E. (2011). Editorial: why nurses don’t publish. Pacific Rim International Journal Of Nursing Research, 15(2), 79-80. McGuinness, T. (2007). Guest editorial. So you want to be a better psychiatric nurse? Try being a writer as well. Journal Of Psychosocial Nursing & Mental Health Services, 45(12), 8-9. Nickitas, D. M. (2013). Getting Others to Write: Not for the Faint of Heart. Nurse Author & Editor (Blackwell), 23(3), 4. Roberts, D. (2014). Getting Your Name in Lights (almost). MEDSURG Nursing, 23(5), 298-299. Sanford, K. (2003). A writer, not a nurse: a funny thing happened on my way to a writing career. Nursing, 33(1), 44-46. Sayers, B. (1999). Challenging roles. The freelance nurse writer role. Nurse Author & Editor (10542353), 9(1), 1-4. Sheridan, D. (1994). Writer’s block: motivating clinical nurses to write for publication. Nurse Author & Editor (10542353), 4(2), 1-2. Stepanski, L. (2002). Becoming a nurse-writer: advice on writing for professional publication. Journal Of Infusion Nursing, 25(2), 134-140. Stone, T., Levett-Jones, T., Harris, M., & Sinclair, P. M. (2010). The genesis of ‘the Neophytes’: A writing support group for clinical nurses. Nurse Education Today, 30(7), 657-661. Watson, J. (2012). The Rise of Blogs in Nursing Practice. Clinical Journal Of Oncology Nursing, 16(2), 215-217. Wolf, D. M., & Morouse, K. M. (2015). Using Blogs to Support Informatics Nurses’ Curriculum Needs. Online Journal Of Nursing Informatics, 19(2), 10.